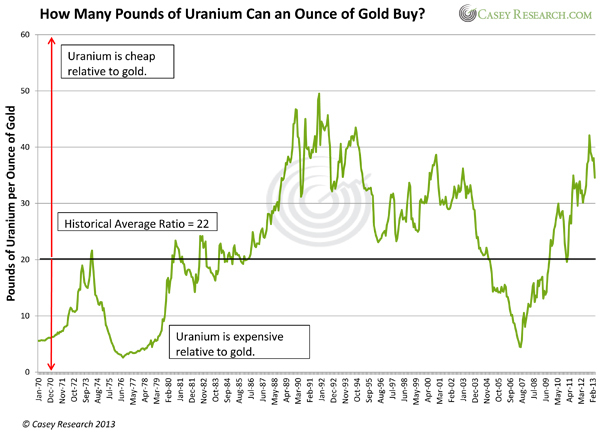 Yes, gold has dropped a lot in the past month, but an ounce of gold can still buy almost 35 pounds of uranium at today's prices – that's much more than the historical average of 22 pounds. In fact, back in 2007, an ounce of gold would only net you about five pounds of uranium. What does this mean? If you consider paper fiat money to be worthless and gold as real money, then the fact that you can buy more of uranium with gold means that uranium is cheap. Right now, we are clearly in the territory of "uranium is cheap relative to gold." Since these types of ratios have a way of going back to their historical averages, this means that in a gold bull environment, uranium is set to increase even more. Still not convinced about uranium? Watch our free online video event, The Myth of American Energy Independence, to learn more about the future of nuclear power, energy security in the US, and the uranium sector as a whole. Some of the most knowledgeable experts in the field, including former US Energy Secretary Spencer Abraham and emeritus chair of the UK Atomic Energy Authority Barbara Thomas Judge, will provide their insights and forecasts for the future of uranium. Watch it today so that you can be optimally prepared to profit from the uranium bull market that's ahead.